Are you missing multiple teeth? Do bridges not work for your particular needs? If you answered yes to these questions, you may be in need of dentures. You may also be thinking that you’d rather do just about anything than get dentures. There is definitely a stigma, when it comes to the idea of dentures. We here at Perkins Dental would like to dispel that stigma with a few facts that should have you feeling a lot more comfortable about your dental care. Comedies have dentures doing everything from falling out at the drop of a hat to biting their own wearers. As adults, we all know that they aren’t going to come to life on us, but we still wonder how often our teeth will just slip out of our mouths at embarrassing moments, or whether they’ll make us look a hundred years older than we are. There may have been a time when dentures were quite primitive. Some historical examples in museums are sincerely horrifying to look at. But the modern truth about dentures is that they come in many shapes, sizes, and attachment options. They are top-of-the-line, custom molded, and shaped to perfectly fit your mouth and yours alone. Partial Dentures: Not everyone needs complete tooth replacement. These dentures fit inside your mouth like a retainer, and can fill large gaps that are either too wide for a bridge, or can’t have one attached. Full-set Removable Dentures: These are more like what we traditionally think of as dentures. They are a full set of teeth that can be taken out at will. They will be custom-fit to your exact specifications in order to be both comfortable and practical. Implant Dentures: These work exactly like the dental implants used for individual teeth. See our section on implants to find out more about how they work and why they might be the right choice for you. All on Four: This refers to an implant technique where a full set of dentures is mounted on a series of four implant roots. This allows the permanence of implants without the intensity and complexity of individually implanting each one. The ability to eat and chew properly is an obvious benefit of tooth replacement. Everything gets easier when you don’t have to restrict your diet by the health of your mouth. Another less-well-known benefit is regaining your voice. The loss of teeth actually affects your ability to properly make sounds. With dentures, you’ll be able to speak clearly again, with no lisping, spitting, or whistling. 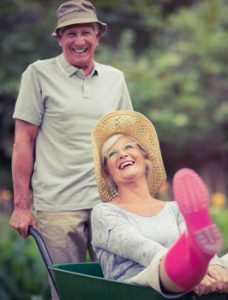 Dentures can help you dramatically improve quality of life. Don’t let any fears or false stigmas stop you from becoming your healthiest self as soon as possible. Give us a call today!